Since last 2 weeks we have been saying that the Nifty is currently trading in a range (With negative bias). Lower end of the range is around 8990. 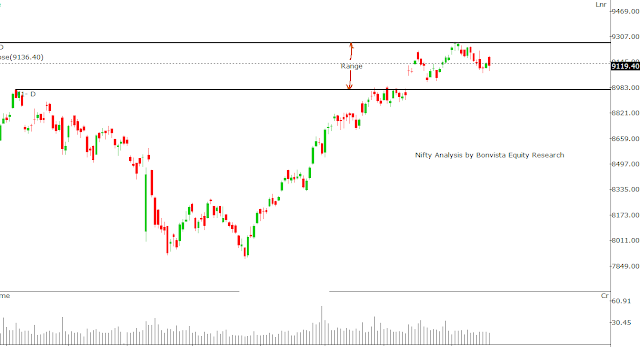 On Friday Nifty managed to close above this level. Higher end of this range is around 9270. Nifty need to break either of these level to give us a clear direction. Since Nifty is trading near a small support within this range, which is near 9110, lets understand how one can trade Nifty now. My view is that if Nifty breaks below this level convincingly it can move further below till its next major support near 8990. This is lower end of the channel. 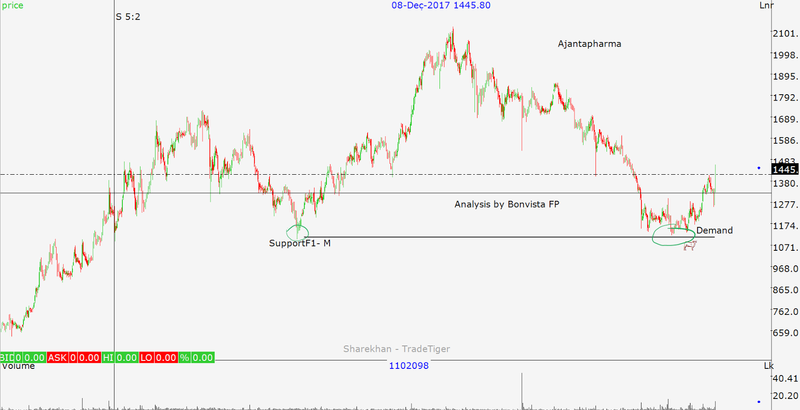 As Nifty is currently trading near a support, short term traders can look to buy Nifty for a bounce of 50-75 points from current level. Broadly speaking neither bulls nor the bears are in charge of the markets. It seems like some time will be spent in the range mentioned above. On Friday Nifty fell by 63 points to close near 9197. This is one of the biggest fall in one day in recent past. We know that markets can not run one way. 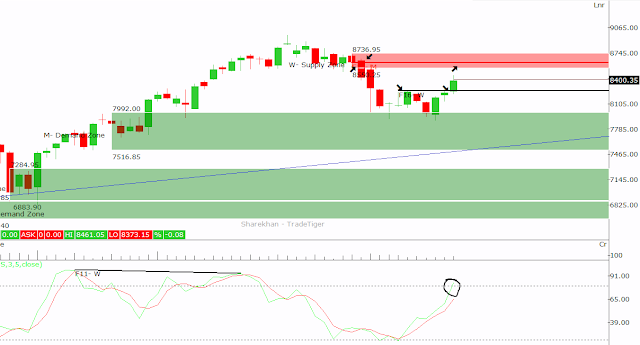 At upper levels you will experience profit booking. This profit booking will make markets move down. 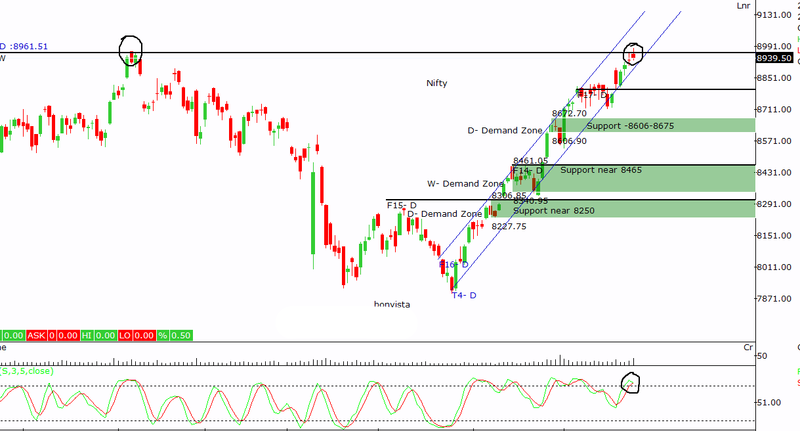 One such profit booking (Long Unwinding) is seen in Nifty at higher levels on Friday. 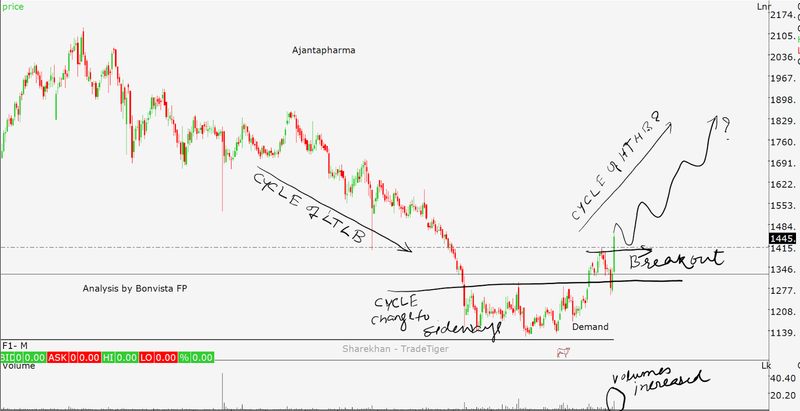 I have explained this with the help of 60 min chart below. 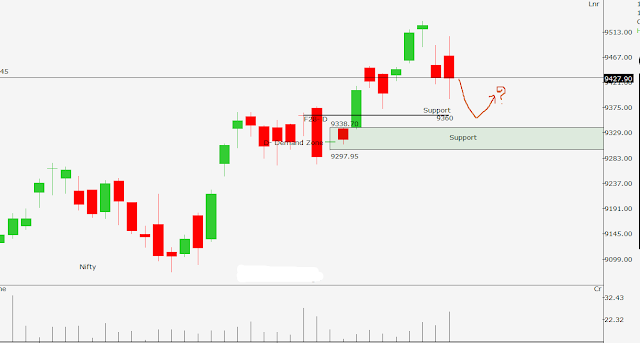 On 60 min chart you can see that Nifty broke below a good support near 9220. This can be start of down trend on 60 mins chart. There are 2 important supports near 9160 and 9133 apart from the current level at 9190. On a lager (Weekly) time frame a inverted hammer candle at the top is just an indication of Bulls Exhaustion. This is just indicating that the markets can remain in a range or see some selling pressure unless it breaks above 9273. Every dip in price will be buying opportunity, as the long term trend is very much up. 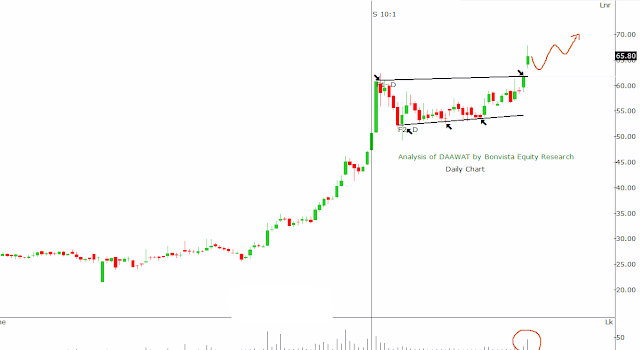 A consolidation breakout in Daawat (LT Foods) is seen on daily chart. You can see that this breakout has come with good volumes. 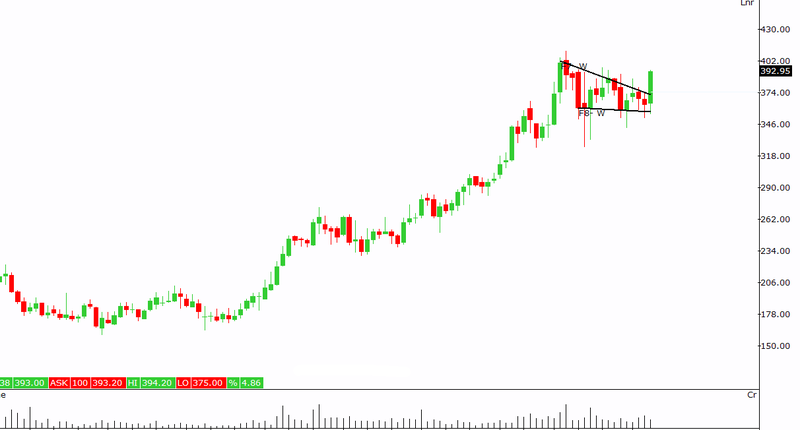 In the process it has formed a pattern called Flag Pattern. The target of Flag pattern is usually large. 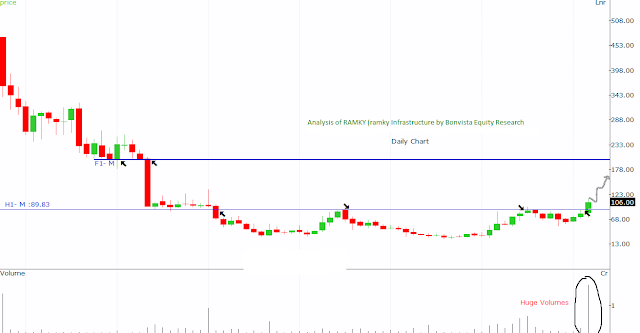 After RAMKY (I had written a small post on RAMKY few days back) Donear is another stock which is forming a nice Rounding Bottom pattern on monthly chart. 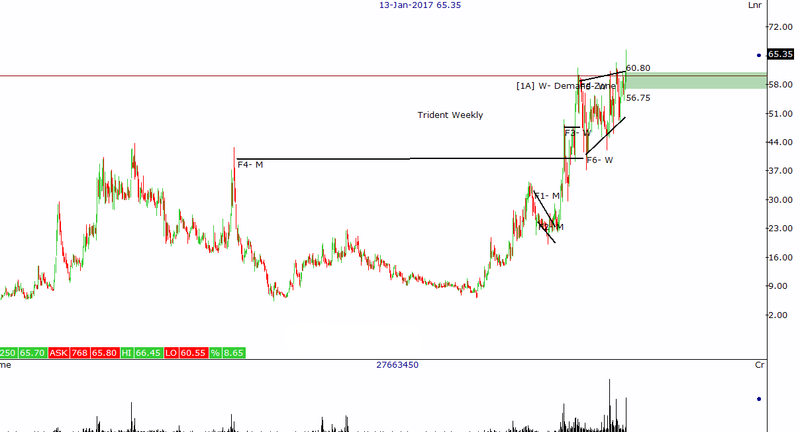 If the stock breaks and sustains above 78, it has potential to move up to much higher levels. the next resistance is near 160. This is might take few months- still worth doubling your money, say in a years time. Financial year 16-17 is behind us. The day on 31st March was a month, week and day end for markets. Hence in this article lets understand broader (medium term) and closer (short term) view of Nifty. You can see below monthly chart of Nifty. On monthly chart Nifty has formed a long upward sloping channel. On the close of March-2017 month Nifty has closed at its all time high breaking earlier resistance. We can expect this bull run to continue for next few months. Of-course there will be small corrections during this journey. 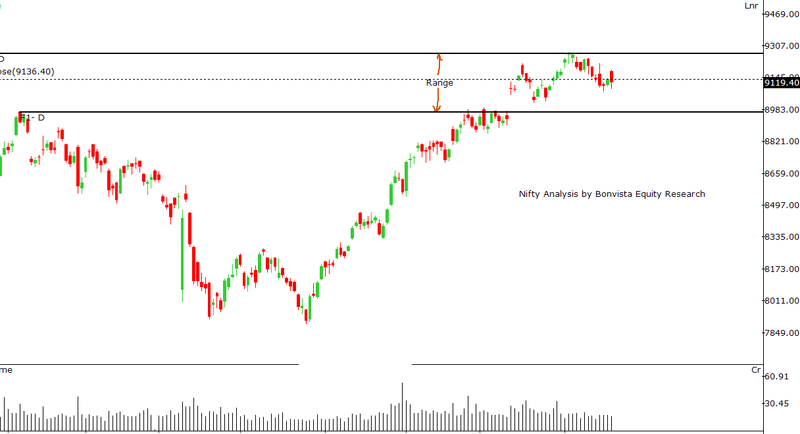 If we are to believe above theory then Nifty can reach to its next resistance near upper sloping line. The target for this run comes near 10,200- 10,400. On weekly chart a similar picture emerges. On each correction Nifty is a buy for higher targets. On a very short scale Nifty has immediate support near 9110 and resistance near 9210. Rather Nifty is trading in this (9110-9210) range of 100 points. A breakout or breakdown beyond this level will make further picture clear. If you go by last week's comment, I had said Nifty need to closed above 8960, which is previous high, for it to start new bull run. Nifty is still struggling to close beyond this point. Detailed view with levels is available to our premium subscribers. For an early entry you need to identify a change in the cycle (trend). 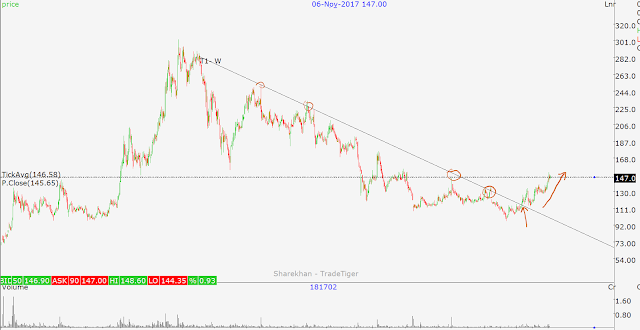 In this case TCS was so far trading in sideways trend. 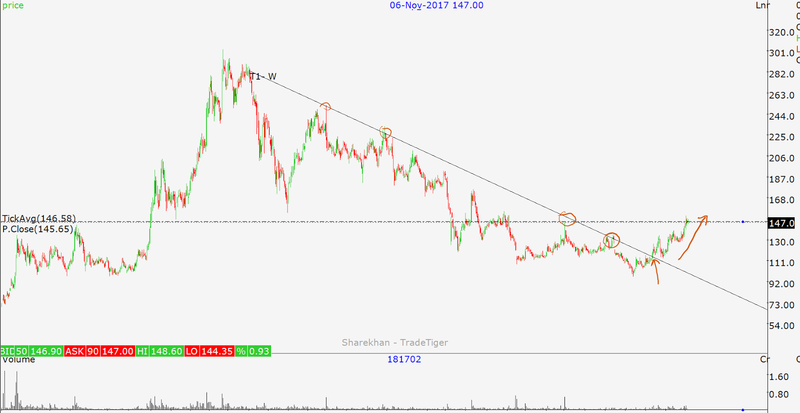 With a breakout in last 3-4 days there is an evidence that there is a probable change of trend in TCS. So the new trend is an uptrend. Most of the important events are past us. The good thing about these events was that they have let India VIX move hardly. This shows the maturity on part of market participants as well as on part of government. The Union Budget and RBI policy were instrumental in not creating hype of these events. They seem to be well focused on essentials as compared to their predecessors. Yes, I mean it. 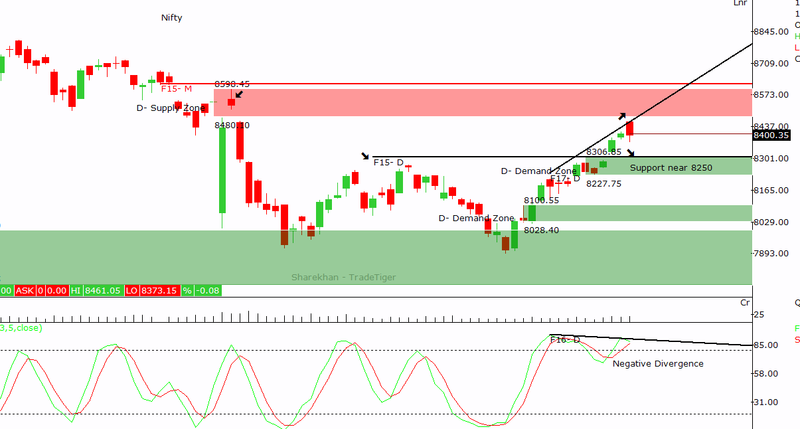 Lets see how Nifty looks like on Technical charts. sh to enter at the cheaper levels than this. 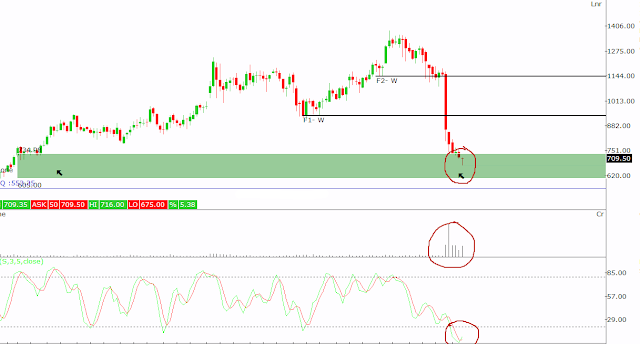 The support areas below suggest that even if correction happens it may have a short living effect. Below is the weekly chart of Nifty. That Hanging Man at the top is little worrisome. This hanging man is formed near the third top. Hence to neutralise this pattern Nifty need to convincingly close above 8968. Any close below 8973 in the coming week will add to the worries bulls. The supportive indicator is also overbought. Trading with caution should be the key for Bulls. Ujjivan and ICICI Pru Life are the two IPOs launched in recent past. Both the stocks are looking lucrative now. 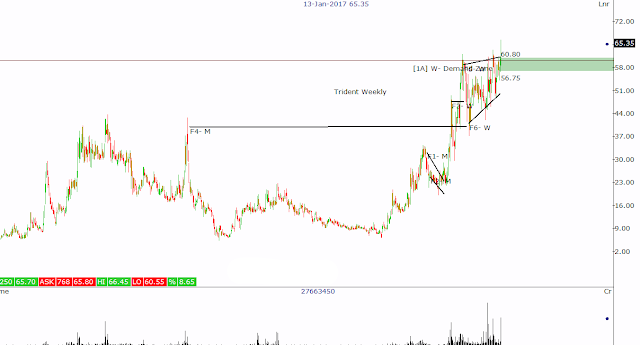 Ujjivan has strongly surpassed its major resistance yesterday to close near 424. 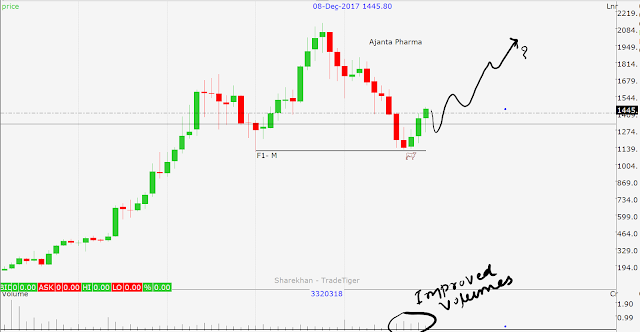 You can see on the chart below that that after posting high near 530 the stock has seen a healthy correction which took the stock to around 275. This was very near to its listing price of 230. 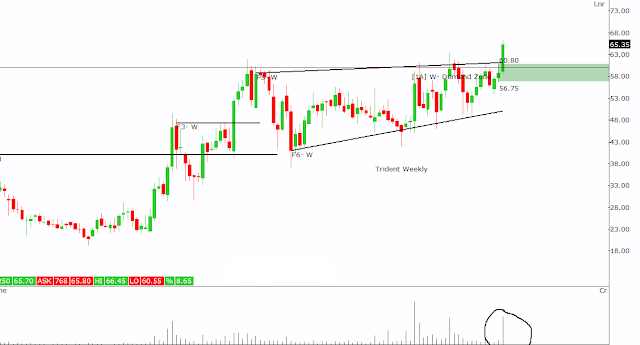 Here on we can expect the stock to continue the momentum. 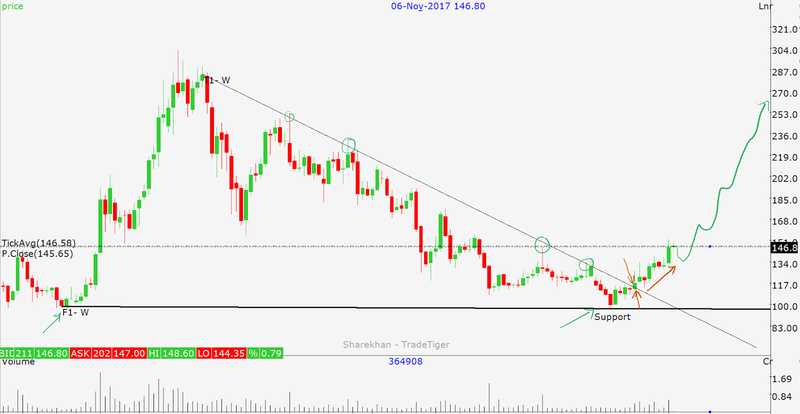 ICICI Pru Life after its listing in Sep 2016, was trading in a broad range between 330 and 285. 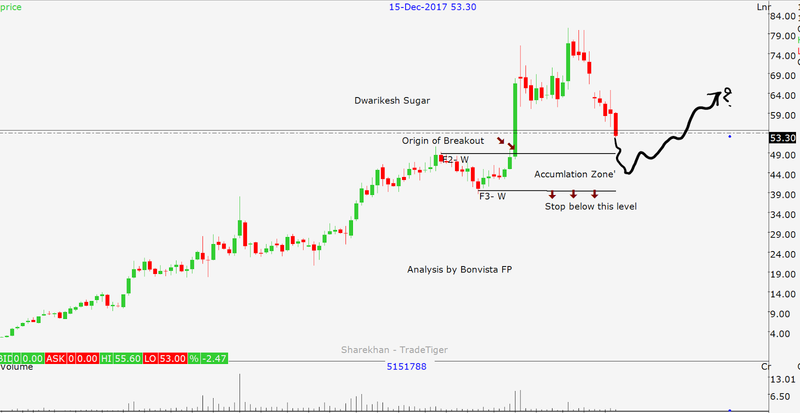 The stock has broken out of this range on 10th Jan. It then went up to post a new high of 363.50. 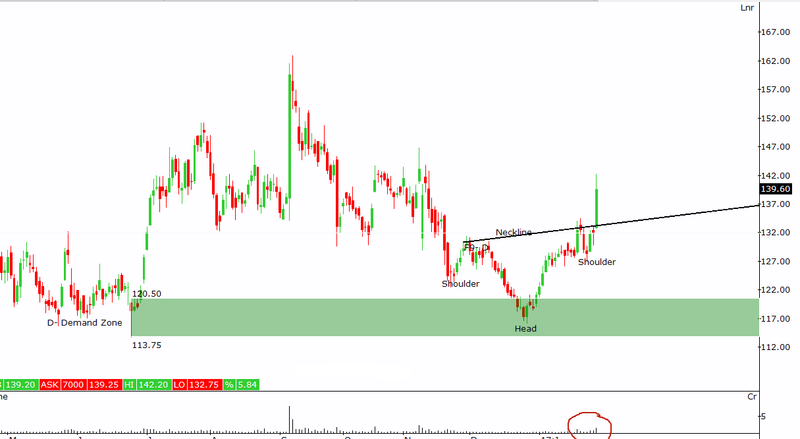 The stock then went into a correction and tested its breakout level as shown on chart. 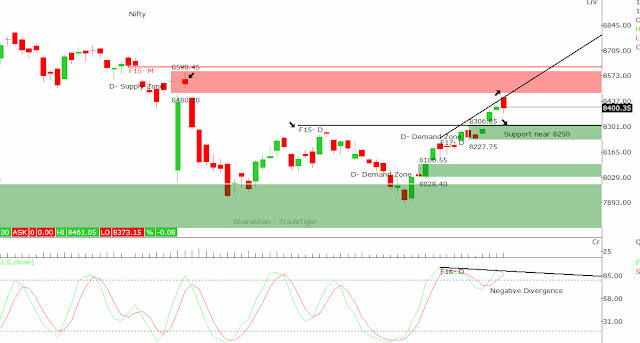 We can expect the stock to continue to trade with same momentum. Analysis and actual entry in a stock are two different things. 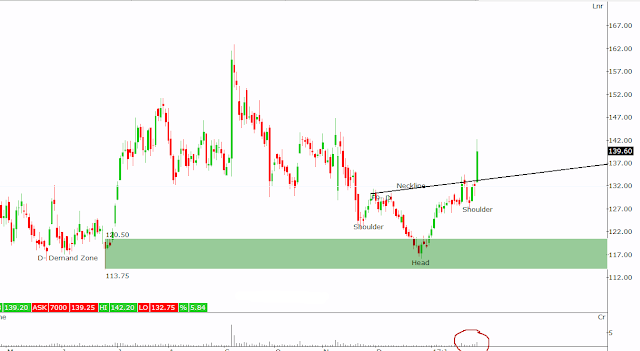 While analysis gives you broader picture about the stock movement, the entry exit levels gives your more refined idea about the risk management. On this blog most of analysis of most of the ideas is given. 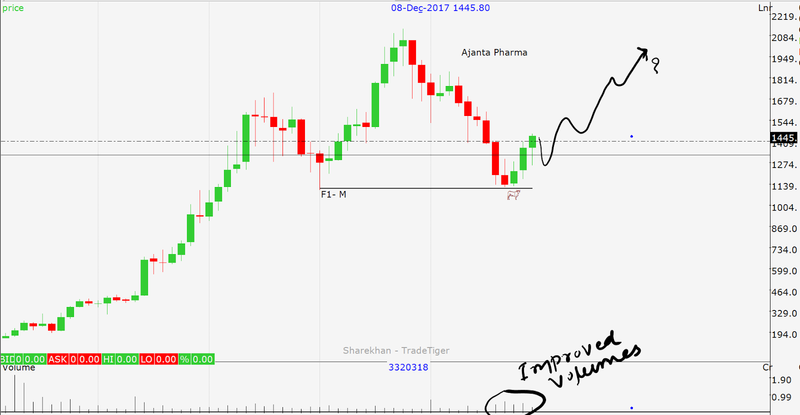 If you are keen to know get the detailed recommendations like Entry level, Stoploss, Target and exposure for a particular script with regular followup on action to be taken, please subscribe to our paid services. We have kept the costing of services very low to make it easier for even the retail investors to participate in markets. You can write us on sagar@bonvista.in or call us at 9371444875 to know more about subscription. For about last 12 weeks this stocks was in consolidation phase. Consolidation is actually a period of contraction. We expect price to remain stagnant during contraction. Contraction periods are usually followed by expansion. Expansion means prices move in either direction. You can see below weekly chart of Petronet. A clear breakout of consolidation is an indication of start of expansion phase. Divis Lab was trading near 1350 in Sep 16. The stock is available near 700 while writing this article. No one is willing to touch it even at this level. 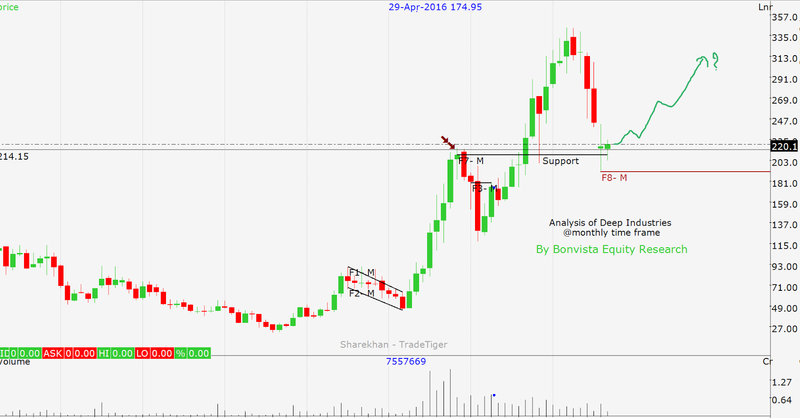 Lets try to understand whether Divis Lab is an attractive buy at this level. The stock is trading near a substantial support area. Biggies would want to buy at this level. I am not saying the stock will start moving up right away from this level. The level might be tested couple of times. 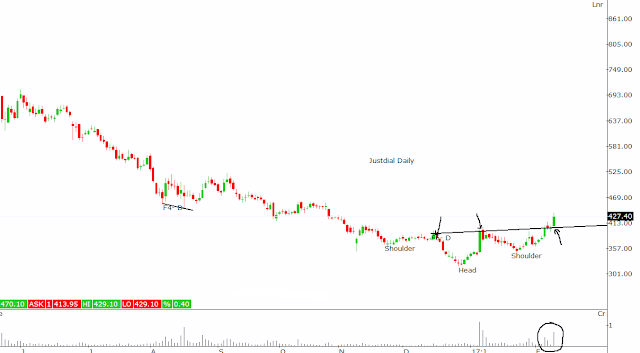 The stock may get into sideways trend for some time. If you have patience and you are ready to wait for some ( a year or so) time there is an opportunity to earn 50% returns here. 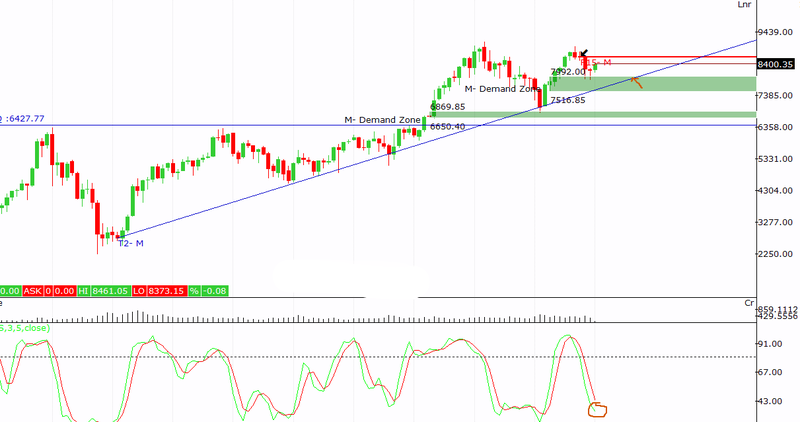 If you look a little closer on the basis of daily and weekly chart, you will find that the chart structure is becoming flattish indicating slow and steady buying at current levels. The buying area is between 600 and 700. So may want to average between this price. Have your risk management in place and you have a nice trade ready to be served. Both below are weekly charts to Trident. In first chart, larger picture exhibits the strength on chart. 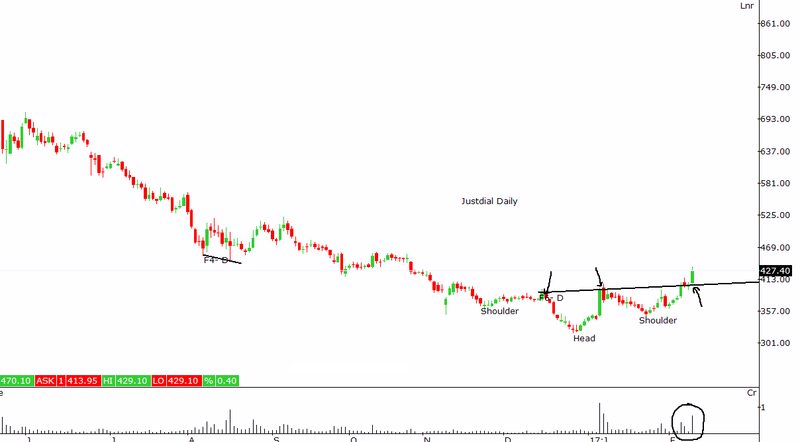 A closer look in the second chart shows an ascending triangle breakout. Here is larger picture of Nifty with the help of monthly chart. You can see that on monthly chart Nifty is taking repeated support on a trend line. This trend line traces back to March 2009. This trend line exhibits a strong support to Nifty in 8000-7900 range. 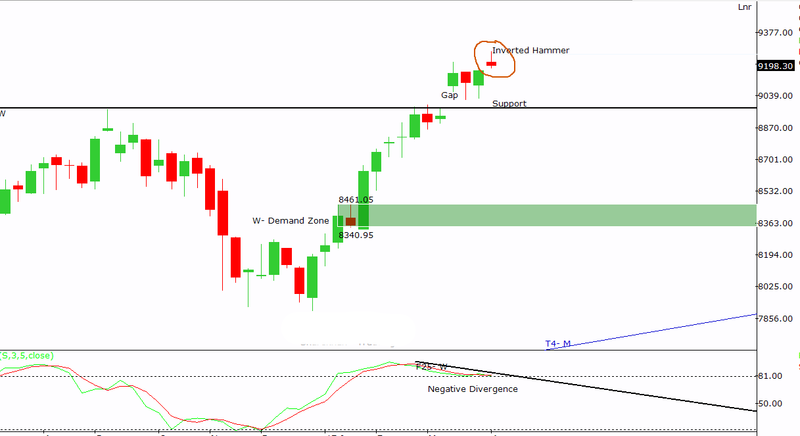 On the monthly chart, last month Nifty has formed a bullish hammer. As a follow-up to this monthly hammer, Nifty is in process of creating a bullish green candle. This bullish green candle is yet to form completely. Larger trend is up. 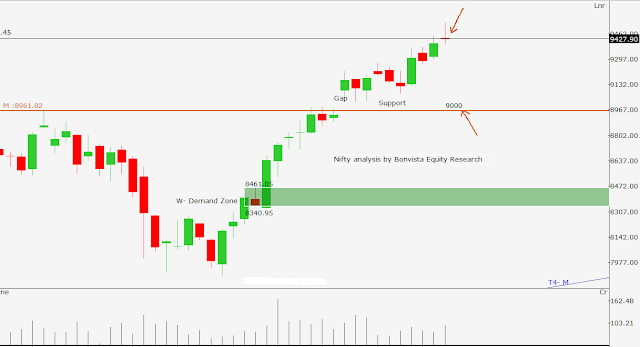 There is a resistance to Nifty in 8500-8590 area. On this larger time frame Nifty is still not in the region which can be called as over bought. 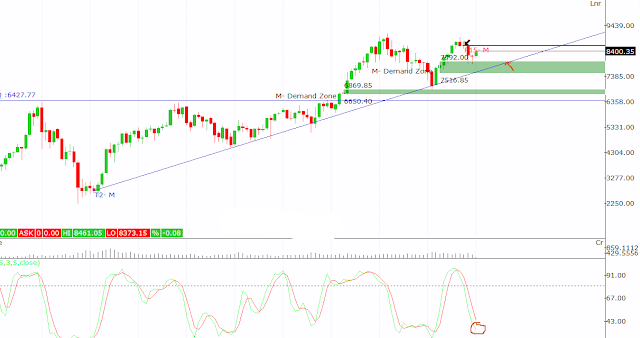 We can expect the uptrend to continue. Correction is a part of an uptrend and is also healthy for uptrend. One such correction can not be denied once Nifty reached its resistance. 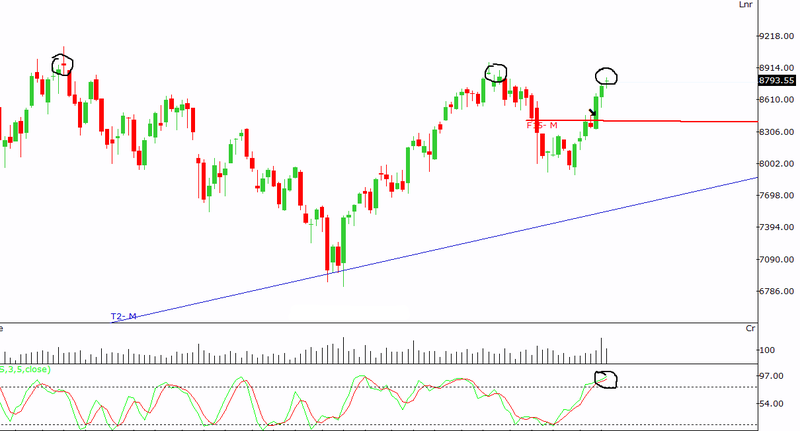 Nifty on its Weekly chart is still not giving us symptoms which is an indication of a downside correction. However some pressure is seen, if you carefully observe daily chart, Nifty is trading in overbought zone and also has its resistance nearby. Major event of budget is schedules on 1 Feb. This event can have large impact on Nifty. 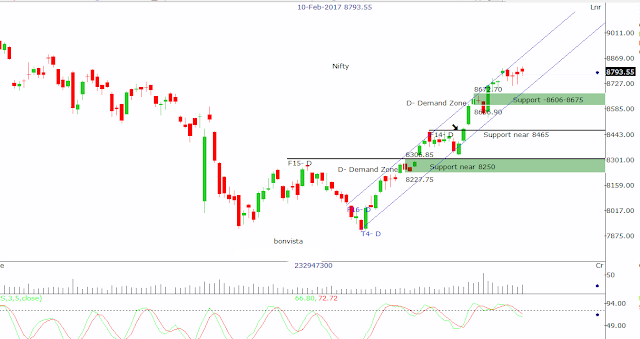 Technically a fall in Nifty to its support near 8250 will be an opportunity to add to the positions, as the larger picture remains positive. Markets usually trades nervous before important event and takes the direction on the day of the event. The arrows on weekly chart below exhibits important areas. On daily chart one can see that Nifty has started experiencing some pressure. 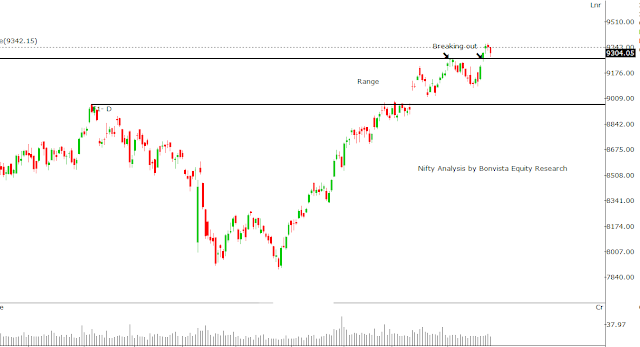 Nifty is also trading in overbought zone and has negative divergence. This is an indication of a correction. However the correction may not be substantial looking at the positive picture on larger time frame. However this is definitely not the time to go long. Wait patiently for the markets to correct and then enter. If you have profits in existing positions, current time may be the right time to book it. For me 8506 and 8255 are crucial levels. At Bonvista Equity Research we believe in simple ideas to make money in stocks. Right analysis with good money management and risk management is the key to earn profits in markets. To have look at our Premium Service visit our website Bonvista Equity Research.